Gary Lineker, one of England’s greatest goal scorers and all round nice guy, scored his last goal in English football in May 1992 after spending over 10 years terrorising defences and scoring in the English top flight for first boyhood club Leicester City, then Everton before a successful 3 year spell in Spain with the mighty Barcelona. He then returned to England signing for Tottenham Hotspurs in 1989. His goal scoring record was great, bagging 234 goals in 442 games. He also ended his career just 1 goal shy of being the England national teams all time goal scorer with a return of 48 goals in 80 caps for his country. He is also famous for never receiving a yellow or red card throughout his whole career. Lineker was a Legend of the game at the latter end of his footballing life, so what now for the 32 year old? It seemed, even though he was still at the top of his game, finishing as second highest goal scorer in the league during his final season at Spurs, he was after a new challenge. That challenge came from Japan, and a lucrative deal from Nagoya Grampus Eight. 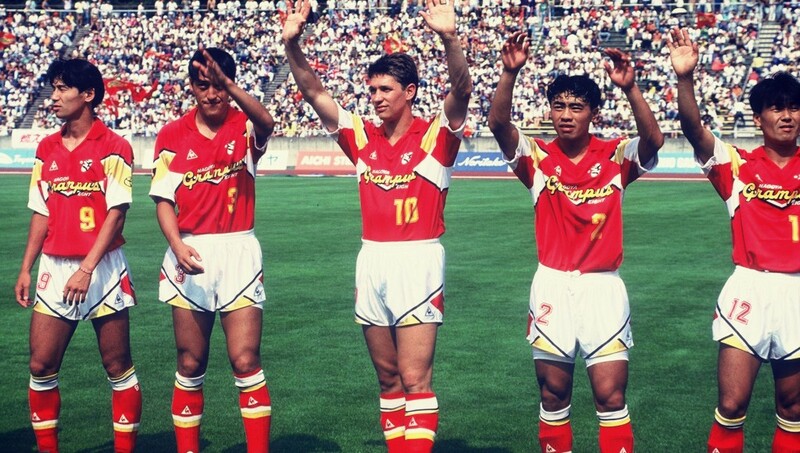 Lineker’s move to Grampus Eight was supposed to be a signal of intent to the rest of the world that Japanese football had finally arrived. For decades football in Japan was a semi-professional pursuit, resigned to the fringes of society and enjoyed by only small pockets of the population. Coinciding with his move in 1993 was the start of Japans first professional league, named, as it is today, the J-League. Lineker was the poster boy and highest paid player and what the Japanese football association hoped would bring interest in the newly formed format. 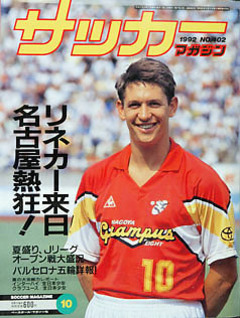 Lineker became the ambassador for Japanese football, similar to how Pele did for the United States during his time at New York Cosmos. After finally arriving in Japan, Lineker realised that not everyone knew his name and he had to explain to his new team mates who he was and struggled in his initial press conferences with the Japanese press. 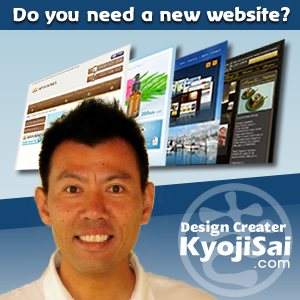 Even though he had studied the Japanese language he found it hard to settle at first in the foreign land. Luckily his coaching staff and new team tried their best to help him settle. Before even kicking a ball for the club he was made a household name, mainly by his clubs main sponsor Toyota, who took full advantage of his ‘gentleman’ image and plastered his image everywhere in many advertising campaigns and multiple goods such as t-shirts and badges, merchandise showing his image where everywhere and to a lot of people in the footballing world this made Nagoya Grampus Eight a household name. 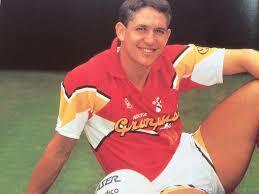 I remember myself even owning a Grampus Eight Lineker #10 jersey in my school days. Once the season finally started, Lineker had a cracking debut as his new team went on to beat Shimizu S-Pulse 2-1, even though he didn’t find the back of the net he looked a different class on the field linking up well with his new team mates. It seemed the ‘Lineker affect’ had rubbed off on all his team mates and he soon opened his goal scoring account. Sadly though injuries plagued his first year in Japan and soon after in June 1993 he was ruled out for 3 months with a broken toe, and then again later that year he was injured again with another broken toe. He thought about retirement but like the professional he always was honoured his contract and continued for another season, much to the delight of the team. He managed just 1 goal in 7 appearances in his first season but the fans were looking forward to having a fit again Lineker back next season. Lineker promised much with his undoubted talent during the initial stages of his second season but struggled once more, with injury relegating him to the side-lines for the majority of the season. In the end he managed 11 appearances, with three goals. For a season of 30 plus games, it highlighted how much injuries had taken their toll. He was highly respected in Japan but it hadn’t worked out in the end for either club or player. He retired in September 1994. He is currently a well-loved presenter on English TV’s Match of the Day show. It was a shame for both the club and the player, and probably the whole Japanese football world that this deal didn’t quite work out. A 100% fit Lineker would no doubt have bagged many goals in the league and I believe he could have made Grampus Eight a top team in Japan and finished top of the goal scoring charts. He will still always be a legend of the game and because of him people in Europe and around the world will know the name of Nagoya Grampus Eight.